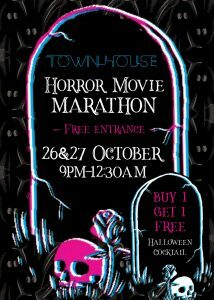 Oct 26 & 27 Townhouse Horror Movie Marathon! Come to Townhouse and predrink with us before venturing into Lan Kwai Fong for all the festivities. You can join us for dinner and stay with us for a horror movie marathon! We will be showing movies throughout the night and food and drinks will be served. We will be offering a Buy 1 Get 1 Free promotion from 9PM – 12:30 AM both nights so don’t miss out!